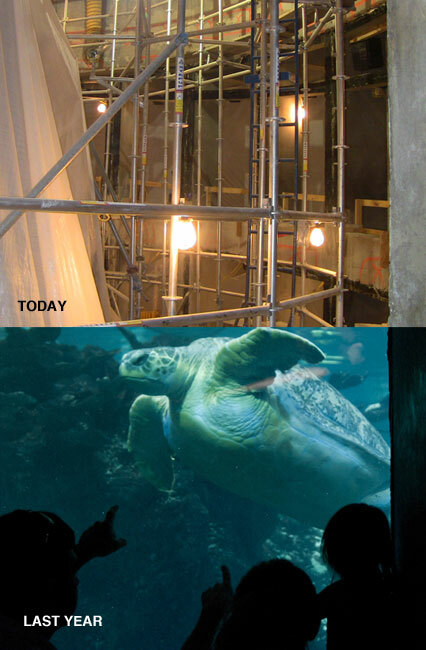 With scaffolding planted throughout the building and the Giant Ocean Tank obscured behind a scrim, it's hard to tell that a lot is happening behind the scenes. But you wouldn't recognize the tank today! 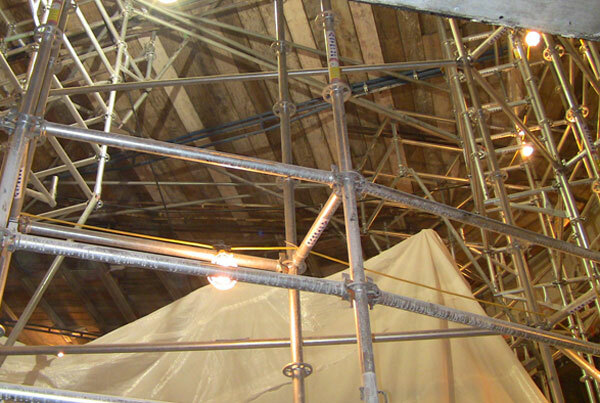 Even more scaffolding is bristling from inside the tank while the remaining coral is protected underneath a white, fabric covering. How many times have you peered over this railing into the blue waters of the Giant Ocean Tank? This is the view from the railing at the top of the tank today. Workers have been cutting wider openings in each of the window frames so the windows will be bigger than ever. Myrtle's a big girl, there will be more window to see her from! And these changes to the windows are just the tip of the iceberg. Where the divers once donned their wetsuits and scuba tanks, demolition crews have cleared the space to make room for a renovated shower and locker room behind the scenes. 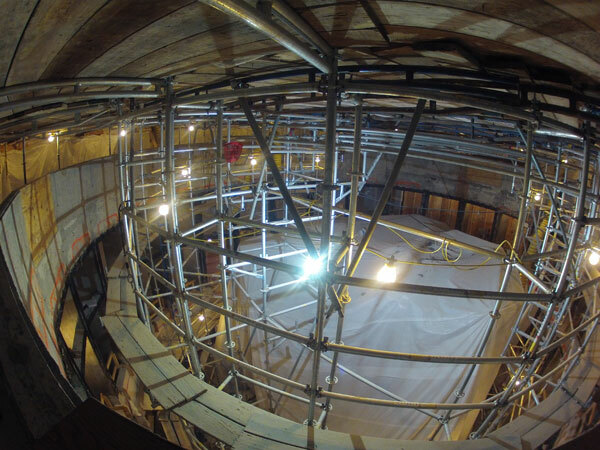 Construction crews are working hard in the Aquarium's attic to create a domed ceiling above the Caribbean reef, crews are preparing to expand exhibit space at the top of the tank and vibrant coral is being manufactured off-site. Keep your eyes on the News and Updates blog for behind-the-scenes updates on the transformation of the Giant Ocean Tank. But really, the most exciting stuff is happening along the exhibit path! Flaherty the fur seal pup is growing more every day, the goosefish grin is unlike anything you've seen before and the close viewing access of the little blue penguins is a special part of their temporary home. So now you'll know what's happening behind the scaffolding when you come visit these amazing animals.